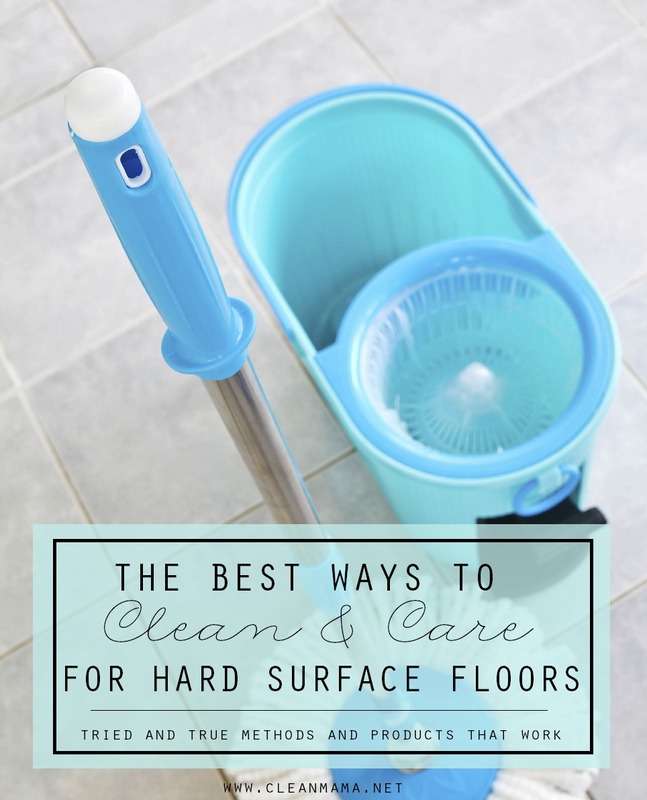 One of the top questions I receive is how to clean and care for hard surface floors. It seems that everyone wants to know what the best method is, what won’t ruin their floors, and how to get the job done quickly and easily. Because everyone loves a clean floor, right? This past week I opened up the floor for your cleaning and organizing conundrums and issues. 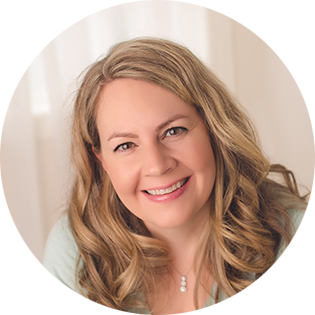 I received a lot of great questions and am excited to share what my solutions are to many of your common cleaning and organizing annoyances are. Keep an eye out for your question to pop up here on the blog, Facebook or Instagram in the coming weeks as I work through them with you. Today’s questions and answers focus on FLOORS, more specifically on how to clean hardwood, laminate, tile and grout. Before I clean the floors, I always start by vacuuming to get rid of crumbs and dirt. If you have pets or a lot of dust, you may want to follow up with a quick sweep using a microfiber based floor duster. If you follow my cleaning routine, Wednesdays are Vacuuming Day and Thursdays are Floor Washing Day. Before using any cleaner, make sure that your hardwood floors are sealed. How to clean your wood floors is not always dependent on the kind of wood but rather the finish that is on them. If you aren’t sure what sort of finish is on your floors, check with the manufacturer. 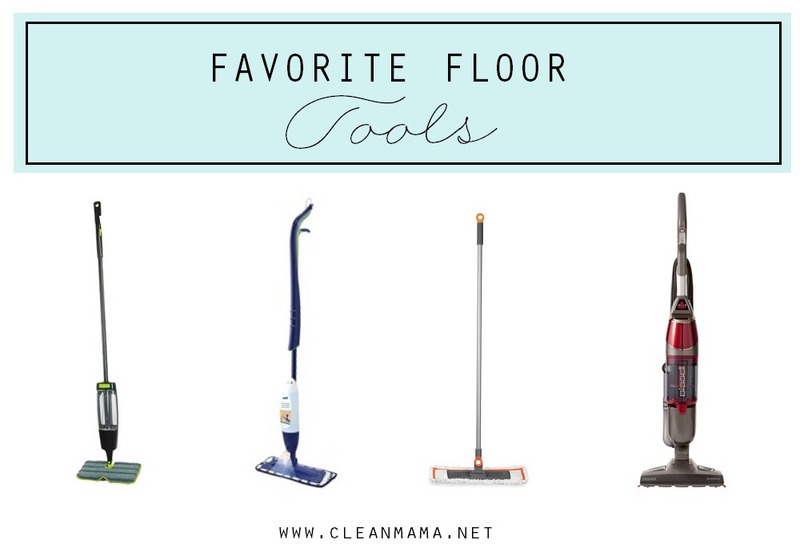 I prefer to use a refillable or microfiber mop versus a steam mop on my hardwood floors. While many people love the ease of a steam mop, my personal preference is to play it safe and use a more gentle, and less moisture approach with the refillable mop. Alternatively, a damp microfiber mop works – just use a spray floor cleaner and spray and wipe you go. If you have unfinished, waxed, or bamboo hardwood floors, the best approach is to use a barely damp (with water) microfiber mop pad. Always check with your manufacturer’s instructions first. A couple helpful tips for streaks and residue on floors…if you are using a microfiber pad, dampen it before starting and rinse often while washing the floors. If you have streaks with a steam mop and rinsing the mop head frequently doesn’t solve the problem, you might need to use distilled water (purchase by the gallon at your local grocery or drug store). If you have hard water the minerals in your water may be contributing to streaking and residue on your floors due to the minerals in your water. When it comes to just what brand or formulation of floor cleaner I prefer, I like to give a range of options and solutions. Some people love making their own cleaners while others prefer the pre-mixed, ready to go options. I only recommend products that are non-toxic and safe to use around people and pets, but these are all products that I use and love. 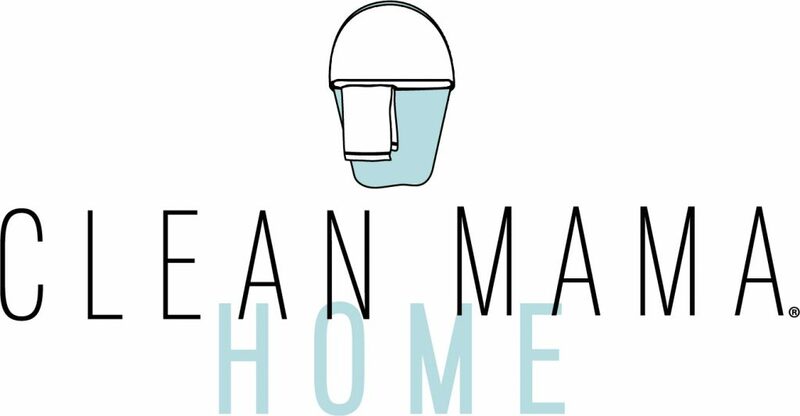 If you prefer the convenience of pre-made cleaners, there are many options to choose from. My favorite brands for performance and safe ingredients are Murchinson-Hume, Bona, and Honest. All of these are ready to use – simply use the spray and mop method or pour into your refillable mop and clean away. Babyganics also makes a great floor cleaner concentrate that is unscented and easy to dilute – you can use it in a bucket and a refillable spray mop and it’s even compatible with carpet cleaners (see the links below). If you like a mop and bucket for washing floors (not my preference), you might like a spin mop. The one that’s pictured in the main photo is this one. One of the biggest complaints I hear about laminate floor cleaners is that all the commercial cleaners leave behind a sticky residue that attracts dirt and dust. My all time favorite laminate floor cleaner is a simple DIY cleaner using every day ingredients. Try out this recipe for an effective, economical solution to cleaning your laminate floors. Again, I prefer using a refillable mop for ease, but this solution can be mixed up and put into a spray bottle as well. The vinegar cleans and the rubbing alcohol aids in the drying and adds a sanitizing component. The combination is great for getting those floors perfectly clean. Laminate and water are not a good combination so you’ll want to use this in a spray format in lieu of a mop and bucket. I like to add several drops of peppermint essential oil for a invigorating and fresh scent. I mix up five ounces of each of three ingredients with 3-5 drops of essential oil to fill an average size spray bottle or to pour into a refillable mop. It doesn’t take long before grout in between tile can show dirt and wear especially when it is in high traffic zones like kitchens, entryways and mudrooms. There are several different approaches that you can take to deep clean both your tile and grout. A favorite tried and true method that takes a little more elbow grease is a combination of cream of tartar and water. Mix up a paste using these two ingredients that is the consistency of runny toothpaste. Using an old toothbrush or a thin grout brush, dip the brush in and scrub away at the grout. The cream of tartar is a natural ‘bleach’ that should help lift the stains out gently but effectively. Check your local dollar store for an inexpensive container rather than paying full price for a little one at the grocery store. For effective tile and grout cleaning, I love using my portable steam cleaner. Homeright makes a great model that comes with a lot of attachments so you can use the machine for more than just tile. The small nozzle attachment combines with the power of steam cleaning works wonderfully on tile and grout especially. Try it on your floor, bathroom or wherever you have tile and grout issues. Homeright has a multi-purpose steam mop that has attachments that cleans grout and tile really well. I hope this helps clear up some questions and gives you some ideas of methods and products that work! I can’t wait to continue the What’s the Best… series! Which refillable mop is your preferred choice that would be safe to use on any surface? You can find them online at Casabella – or you can also find them at Target, Homegoods, The Container Store, Bed, Bath & Beyond, etc. 🙂 Sometimes you’ll see them in white/green color scheme – it’s the same mop. Do you use this around your toilet? 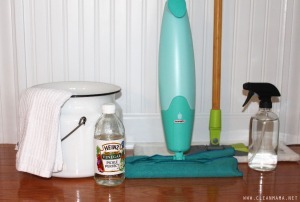 Do you rinse after using the homemade laminate floor cleaner? Yes…which refillable microfiber mop do you recommend? Thanks! Where can I find the mop and bucket that you have pictured? Thanks! If you ever find a microfiber pad that gets into the grout on tiled floors I’d love to hear about it. I’ll do anything to not have to get down on my hands and knees with a toothbrush. Thank you for the laminate cleaner recipe! I have always cleaned my floors with vinegar and water but found it leaves the laminate looking dull and streaky. I caved and bought some Bona laminate cleaner, which I like, but prefer the non toxicity (and price!) of homemade cleaner. Can’t wait to try out the rubbing alcohol! Great post and on time for me. Thank you. I also have some questions. What microfiber mop do you suggest for hardwood floors ( I know I will not get refillable one right now)? And You mentioned you like lemon essential oil for floors may I ask you why? Is it because of fragrance or also some other attributes it has? Has anyone had success with mops? I haven’t found anything that actually works anything like cleaning on my hands and knees. Me too! I feel like these mops only move the dirt around the floor! The closest thing I have come to cleaning a floor as well as hands and knees is the spin mop. There are a variety out there. I find the one with the foot pedal is easier on my neck and shoulders but the one that is less expensive and uses the handle to spin out the excess water is good too. I love my Hoover floormate! It cleans my tile floors better than anything I’ve used in the past. The spinning brush cleans the grout well. I like the fact that it uses clean water and vacumes it up immediately leaving the floor almost dry. Which essential oils do you use? Can I go with an inexpensive one? The therapeutic grade ones are soooo pricey! Will your DIY cleaners work when you use a steam mop? i.e., I can use the solution in the water chamber? If I only use water in my steam cleaner than is there some other cleaning solution I would use to clean tiled floors or would I only mop with water in the steam cleaner? Nope, all you need is water! Becky, you are advertising three different steam mops that I am looking at buying, however I don’t know which one to choose from. I am looking for a good steam mop to clean my tile floor. Looks like you recommend two different HomeRight products. 1) C800880 Steam Machine Steamer (according to video, it looks like this has a handheld stick to be used for mopping, right?). 2) Home Right C800949 Multi Purpose Steam Mop. What about the Bissell 1132A Symphony All-in-One Vacuum and Steam Mop? You recommend them all but I am having a hard time deciding which one would be best. Please help me out before I make this purchase. I use the shark on tile and just water to steam – is that truly cleaning? I don’t get the nice clean smell. Great tips! I am wondering if the cream of tartar should only be used on white grout? If it’s a bleaching agent I’m worried it would bleach my gray grout. I *hate* mopping! I actually just let my cleaning lady go so I’m doing all myself. Mopping kills my wrists because of how much pressure I have to use to get our floors clean (3 people, 2 dogs). Our whole house (about 3500 sq feet) is laminate so it can be a quite a bit of mopping. I don’t do the bedrooms much at all, just vacuum them. Suggestions? Thanks for the post. I’ve been using your hard wood floor cleaner for sometime and will definitely try the laminate one too. What do you use as a regular cleaner on tile? Is the laminate cleaner safe on tile floors? I have engineered wood floors. Does it require the same cleaning as wood floors or something else? this may be a silly question, but can I use the laminate cleaner on vinyl? Yes! You should be good to go! This isn’t exactly a floor cleaning question but an afterwards question. I’ve moved to microfiber cloths and spray mop with detachable cleaning pad…but I don’t have easy access to laundry facilities. I rinse and hand wash but um…well…eeewww! Any suggestions? Thanks! Thanks so much! Can’t wait to try the laminate recipe. At the drugstore yesterday I noticed 2 bottles: isopropyl alcohol and ethyl alcohol. I thought isopropyl–medical like an alcohol swab–was ‘rubbing’ while ethyl is what’s in vodka, gin etc. But only the ethyl bottle was labeled as “rubbing” alcohol! So which do you use in the laminate recipe — Medical or Drinking?!? Could you use ethyl in place of vodka for disinfecting? I love my steam mop – Casabella also has a spin mop like the one in the image that I think is superior to this one 🙂 Thank you for the kind words! I have very dark wood looking laminate floors in my kitchen and dining room. Even when they are clean, they look dull and awful. I’ve tried so many cleaners, including all the ones you recommended in the article above, as well as half a dozen floor cleaner “recipes” with water and vinegar and rubbing alcohol. 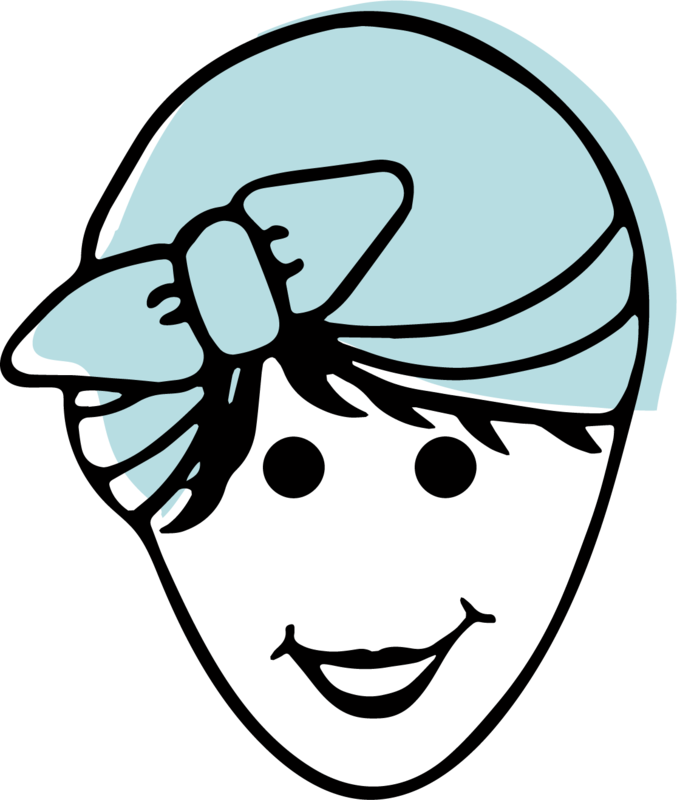 I have tried a dry micro fiber mop, scrubbing with scrubbies and a bowl on my hands and knees (somehow I pulled something in my knee – not fun) and recently a regular mop and bucket and Mr Clean all purpose cleaner. I wish I could post the sad pics of my floors. As I clean them, a sort of bluish gray cloudiness appears, which eventually dries super dull. Any advice would be so appreciated. I’m at a loss. The cloudiness can be from hard water and/or needing to clean the pad more frequently. Sometimes I use a little pine-sol on my laminate floors but I always rinse the mop thoughly and go back over the floor. Soap residue from commercial cleaners will leave a dull cloudy finish. You don’t need to rinse when you use vinegar. I’ve had the same issue with cloudy, sticky floors after using the vinegar, water and alcohol mixture on laminate. If the cause is hard water, do you recommend using distilled or filtered water to remedy this? I have natural stone floors (travertine, marble, and slate) in various rooms in my home. I’ve always heard NOT to use vinegar when cleaning natural stone even if it’s sealed. Any suggestions for something that is safe for my natural stone yet can handle the mess that comes with kids and large dogs? 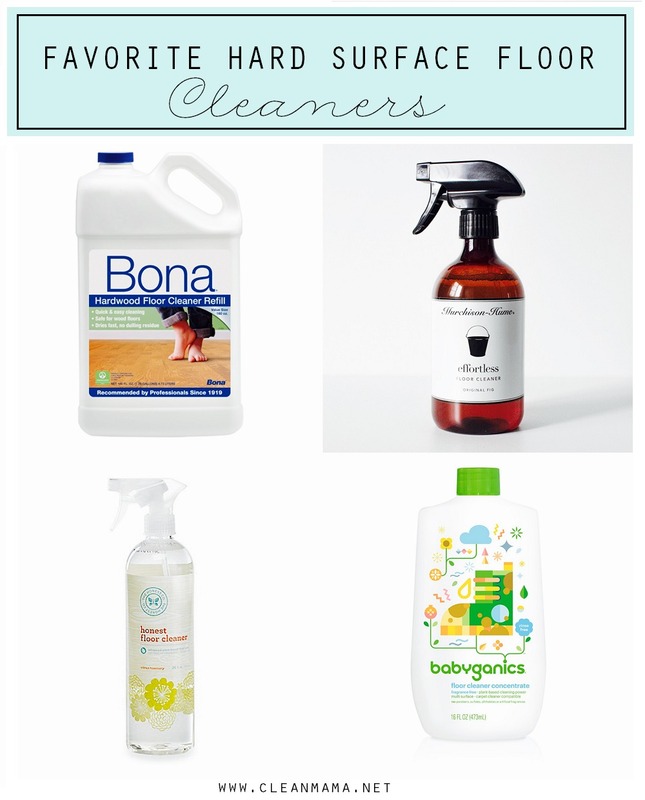 I would recommend Bona floor cleaner – there’s a simple/natural version that I really like. For grout, mr clean magic sponges are wonderful. It is a hand and knees job, but so worth it. Get a big box, put on some music and scrub away. We had a whole house with tile, I’d mop first and then scrub away. Then reseal the grout. Good as new. Have you tried a steam cleaner? They work GREAT for tile and they’re so great with kids because there aren’t any cleaners involved but they sanitize. Hope this helps! I hope you can help me. I saw that you do not recommend cleaners on “unsealed wood.” How do I clean my floors if they are unsealed? Sealing them is not really an option right now. We have unsealed wood in our 3 bedrooms and main hallway. Dust/vacuum them regularly and I would mostly use warm water and a refillable microfiber mop to clean them. Make sure that there isn’t any standing water left on them when you’re mopping. Occasionally you could use the water/vinegar mixture but I would test first in a little spot to be sure it doesn’t harm the floors. I hope this helps! Thank you for the hardwood floor recipe. I have the Reveal refillable mop and tried the Bona cleaner with it – not good. You really need a mop you can rinse when you use that cleaner. Your homemade recipe left my floors streak free and residue free and a little slippery under my socks (I like that!). I do think I’ll add more essential oil though. I did 4L of water, 1/4 c of white vinegar and 3 drops of lemon essential oil and I could still detect some vinegar scent when I was finished. It didn’t linger over night though, which I liked. Thanks for the great cleaning blog! I’m a mom to a toddler with a baby due any day now. I work full time out of the home (but have 6 months of mat leave coming up). I found your blog just in time to get things under control and in a schedule before baby arrives. I feel at peace going to bed in a clean house and taking the time to do little things everyday has left me more time with my toddler – not less like I feared it would. Keep up the great work! I look forward to each post! Great feedback and best wishes – thanks for following! Hi!! I have a un sealed hardwood floor (it’s similar to barnboard – rustic/rough with imperfections) I don’t want to ruin it and have only been lightly mopping with water since I we moved in…am I doing the right thing?! We are laying tile in our kitchen and have marble in our bathroom. What is your recommendation on cleaning these surfaces on a weekly basics? Thanks, love your site!! Where do I buy the essential oils you are always talking about? How do you feel about Mrs Meyers all purpose? Does it compare to any of the products you have linked above? Thanks! What do you suggest for cleaning/polishing engineered hardwood floors (ours are REALLY dark if that matters at all)? Hi! We just bought s house with a lot of tile. There’s little divets throughout and they’ve collected a lot of dirt. Should I get the home right portable steam mom to clean or both the portable and an upright steam mop. I found that my shark steam mop did not clean. I’m hesitating buying another. Thanks! I might hire someone to deep clean the tile – most carpet cleaning companies provide this service (like ServiceMaster). Then I would purchase an upright steam cleaner (I like the Bissell) and use that after it’s cleaned really well. Thanks for these tips for deep cleaning tile and grout. I’ve seen portable steam cleaners around for tile floors, so it helps to know that they can be effective. It might be a good idea to try steam cleaning the stains out of my tile and grout. Recently purchased a steam cleaner & I’m loving it however the people who lived in the home previously to us had big smelly dogs & weren’t very good at their housekeeping. Since steam cleaning the tiled area where their dogs used to live (the dining room – gross!! Our dog lives in the hall not near food areas!) I’ve noticed a doggy smell like it’s coming from the grouting/tiles. Other than continuous cleaning and hoping time will resolve it can you recommend anything to get rid of the smell?? Should I manually mop using a fragranced cleaner before/after steaming? I have painted concrete floor that’s made to look like stone. It gets horrible staining, water stains perhaps? I have tried various mops and cleaners, but nothing helps. Any ideas? Thanks. Rinse your floors a couple times and if you have hard water try using distilled to wash.
Are the spots from hard water? I just bought a regular mop vs. a refill mop today and just washed all of my floors, any tips on cleaning the nasty mop after the floors are done? What vacuum do you recommend for hardwood and tile floors? I love my cordless Dyson for hard surface floors! Hi Becky, first I think you’re great!! I have travertine tile and use the shark steam cleaner on it which I love! However just using steam doesn’t leave the house smelling clean. What would you recommend using to give my house that ” I have just been cleaned floors smell”?? I love essential oils think I could drop a few drops in the shark?? I accidently used white vinegar in my steam mop and did not notice till the strong smell hit my nose. Tile floor looks really clean, will it hurt my mop? it is also safe for protect baby from jams . Thanks for share. I had some essential oils to erode a finish on a piece of furniture. Why is it safe to put on hardwood floors? Is the oil just for the scent? The essential oils are highly diluted – I’m guessing the EOs you used were straight on the furniture and not diluted? Any suggestions for mopping stained concrete floors? We were originally told to use a water/bleach mixture but bleach gives me a headache. I’ve tried sponge mops and microfiber flat mops and they all leave streaks. Try white vinegar + hot water instead! What would you recommend for cleaning vynil floors? Becky, I like the damp mop version of cleaning my floors, and was wondering where to get the micro fiber mop that is shown in your picture above? I have some but they are getting older and over used, and the company I bought them from is no longer in business. Mine look very similar to #3 in the above picture. You used peppermint oil in your laminate cleaner- could I substitute lemon or another oil? What’s the ratio for the laminate cleaner? And what do you recommend for vinyl flooring? equal parts for the laminate cleaner and a steam cleaner is a great vinyl cleaner. Hi Becky! I discovered your site recently and love it so much! Is there a floor solution that’s good for both hardwoods and laminate flooring, or is it best to use separate solutions? Thanks! Are steam cleaners safe for marble tile? What cleaner will work best on grout between marble tiles? I have white marble tile on bathroom floor and was told not to use traditional cleaners because they can scratch and discolor them. But I was also told that standing water will discolor them as well, which makes me nervous about steam cleaners. The tile was expensive so I’m super nervous about messing them up. We have engineered oak floors. It says explicitly not to spray cleaning solution on them. We vacuum or dry mop almost daily, but when we use Bona with a stick mop, the pad is dirty only in the middle, where the stick handle is. The sides don’t get as dirty, and I’m sure my floor is not getting clean. Is there a stick and head that will evenly distribute the pressure. Note that I cannot use a steam cleaner or anything that moist on these floors. I just bought a steam mop. Just a semi cheap shark brand to try it out on my laminate floors. Is this safe to use on my laminate and tile? Also is it safe with your vinegar, alcohol and water with oils recipe? If the steam cleaner says it’s for laminate and tile, give it a try! Never use anything besides water in your tank – you can add a drop or two of essential oils to the damp microfiber pad for a little scent, but that’s all I recommend.